Rain, wind and a dismal forecast resulted in disappointingly low public participation. We had one each, Volt, Leaf, C-Max Energi, MiEV and two Model S on display and providing rides or drives. 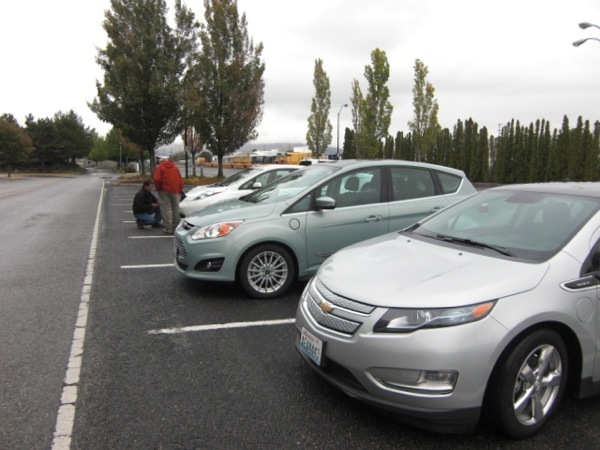 We concluded that the Wenatchee Convention Center was a good venue because it highlighted the six L2/L3 charging opportunities in Wenatchee but that it did not have adequate public exposure. Next year we will pick a more actively public venue. This is your opportunity to see, touch, ride in and possibly drive an Electric Vehicle. Cars from Chevrolet, Ford, Nissan and Tesla are scheduled to be on the parking lot starting at 10 AM. Rides and Drives will be scheduled at the registration tent on a first to arrive, first to be scheduled basis. You may pre-register by ordering free tickets at https://www.eventbrite.com/event/8230988107 then e-mailing your desired time to jmasea@prodigy.net.